The afternoon opened with a cloudy sky over white fields. A layer of snow made the farm road to an inconspicuous valley a bit slippery. Caver and Cave Preserve owner John Ackerman, who lives south of the Twin Cities, easily navigated the turns to a specific cave complex known as Spring Valley Caverns. The short walk to a building he had constructed as an entrance to three cave passages revealed nothing out of the ordinary. Yet Ackerman’s eyes lighted up like a kid among the multi-colored treats in a candy store. He said he spends most weekends caving in Fillmore County. This Monday afternoon, he would manage to incorporate an expedition with this reporter through Spring Valley Caverns as part of a round-trip visit to Albert Lea for his furniture refinishing business, located in Burnsville. In May of 1966, John Latcham purchased the 470-acre farm northwest of Spring Valley on a contract for deed from Ammon Grems. This young farmer discovered a newly opened sinkhole while searching on horseback for a lost calf. He investigated the open hole and invited geologists and cavers to explore and map this half-mile long cavern. John Ackerman , who lives south of the cities, has elected to explore and preserve cave systems throughout Filmore County and in northern Iowa. Clockwise from bottom left, "digging out the artifact sink" (sinkhole) to explore a new passage at the Cave Farm near Spring Valley; Ackerman by a flowstone formation, and the entrance building he constructed at Spring Valley Caverns on the Cave Farm. Soon after, the decision was made to commercialize the cave with his partner, Roger Winters. Passage floors were graveled, electricity was brought in and stairways were constructed within the cave. Tourists flocked to the cave for over two years, but in 1969 it closed, following contract problems. In 1983, the Minnesota Speleological Society (MSS) was allowed access by a new owner, and then explored and mapped the cave system. Ackerman then met the new owner. He took the half-mile cave tour. Later he and other cavers found an additional 5.5 miles of cave passages. “It was just incredible,” said Ackerman. That was the beginning of something special for him. Ackerman started buying farmland in the area, now owning 500 acres containing at least 22 caves. He named his farm “Cave Farm.” The cave system originally offered to the public commercially is now called Spring Valley Caverns. Venita Sikkink, who lives near Cherry Grove, is shown with John Ackerman. He purchased land from her and created a second entrance to Goliaths Cave. He explained he uses Spring Valley Caverns for educational purposes, including taking school children, groups from the Quarry Hill Nature Center in Rochester and others on tours. He also makes his caves available for University of Minnesota research projects, citing U of M Professor Calvin Alexander as one of the top experts in the country on caves. Feeling strongly that cavers should share their discoveries with other cavers, educational researchers and the public, Ackerman has also acquired land rights to two other cave systems. He’s constructed his own entrances to both, creating some controversy with his actions. 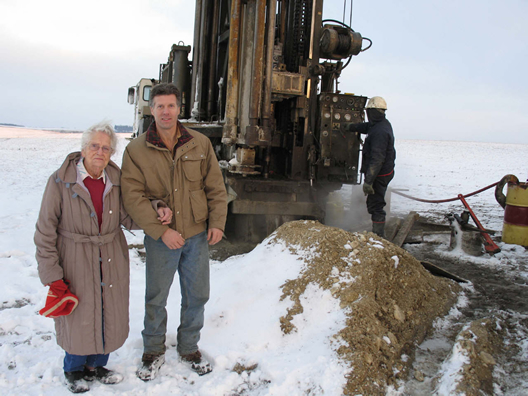 This fall Ackerman purchased two surface acres and 358 in underground rights from Venita Sikkink near Cherry Grove over what he said is an “extensive” system known as Goliath Cave. He explained that Minnesota cavers had originally mapped the cave. Once the Cherry Grove Scientific Natural Area (SNA) was set up through the Minnesota Department of Natural Resources (DNR), however, the entrance to Goliath on the SNA was gated. Ackerman said he had contacted the DNR to again open up Goliath to cavers. When he felt there was little hope it would be opened soon, he purchased the land from Sikkink and drilled a 75-feet deep access shaft to the cave below. He was happy the cavers who had mapped the cave would once again have access. In the mid-1990s, access restrictions also led Ackerman to look at the possibility of a second artificial entrance to the famed Coldwater Cave in Iowa. Designated a National Natural Landmark, 17 to 18 miles of passages, spectacular formations and an underground river make up the cave located a few miles southwest of Canton. The Cave Preserve website notes that in 2002, Ackerman bought five surface acres, along with 200 in underground rights. In 2003 he drilled a 188-feet deep shaft, 30 inches in diameter. The project was completed in May of 2004. “This area (southeast Minnesota and northeast Iowa) became important to cavers, geologists and researchers. It’s important to have access to caves,” said Ackerman. Leading the way through Spring Valley Caverns, Ackerman still excitedly talked about cave features. He explained that the karst topography of southeastern Minnesota starts around 10 miles west of Spring Valley Caverns. Looking at his feet and then above his head, Ackerman pointed out both the Stewartville and Dubuque layers of limestone, respectively. The Stewartville layer is where stream passages occur and goes to around 150 feet into the ground. The Dubuque layer typically extends down 75 feet. Ackerman said that where the layers meet passages and formations are usually found. As he passed a flowstone formation alive with a light coating of water, Ackerman talked about “speleothems,” or mineral deposits formed in caves by the evaporation of mineral-rich water. The University of Minnesota, he explained, has dated some formations from caves, finding them to be as old as 40,000 years in Spring Valley Caverns. He mentioned one room that’s “big enough to fit a house in” named the Colossal Room by cavers. He stated the explorations are amazing, while noting he’d almost drowned a couple times in cave stream passages. Ackerman can often be found using a backhoe-type excavator called “Cave Finder” to clean out sinkholes, filled with dirt and trash from the past. A location that became known as the “Artifact Sink” on the Cave Farm received the most publicity, according to Ackerman. Like most sinkholes, this one had been used as a dump by the original landowner. Various pots and bottles were uncovered down to about 10 feet. Some were thought to date to the 1860s and were donated to a Fillmore County collector. Along with trash, glacial till also was dug away. They found an opening so large that a tractor and loader could be driven in to remove further dirt. “We rarely use explosives,” said Ackerman, although at times he stated they are used to create entrances or widen very tight passages. He also helps with cave rescues. Ackerman said he’s done the research to be able to use small explosive charges close to a person’s body to enable a rescue. The Cave Farm will host the final day of a cave rescue seminar in the spring, he noted. After all these years of explorations and continued finds, it appears Ackerman will never lose his enthusiasm for the world of caves and all they hold beyond the ordinary.